The Wedding Flowers Guide is your place to get tips, inspiration and ideas to plan the flowers for your big day. 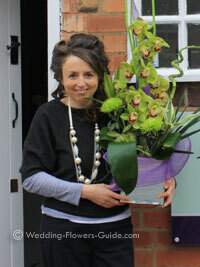 We are professional florists who specialise in creating beautiful flowers for weddings. The photos and ideas that you see here are based on our own experience - these are real, practical, wedding arrangements for real brides. In fact many of the photos on this site are quick snaps taken just before we rush the flowers to the bride on the morning of her wedding. Choosing the flowers is the fun bit of planning your wedding. You'll get lots of good ideas by browsing through the pages listed on the left hand side of this page or the links below. There are so many things to decide about when choosing your flowers. We're here to help you through the process, using our years of experience of helping brides plan their flower arrangements. I'm Cindy and I work as a wedding florist. Having spoken to hundreds of brides over the years, I know that one of the most useful things in planning your wedding flowers is to see examples of what is possible. 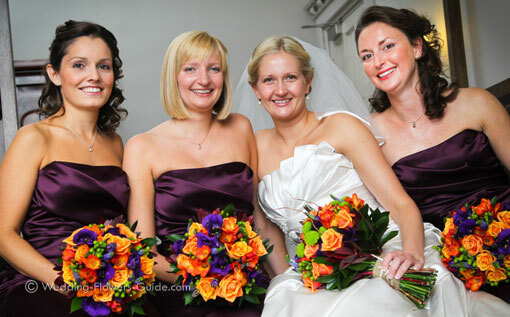 To help you with ideas, I have featured some of the real weddings that I have created flowers for. I have also categorized this site so that it is easy to find information on the flowers you are interested in. If you have any questions, please let me know by contacting me. Enjoy looking through the site. I hope you find inspiration for your dream wedding flowers.